Medtronic, Boston Scientific Corporation, and Cardinal Health – the top three companies in the global market for micro guide catheters - held slightly over half the market share in 2015. This makes the competitive landscape overall consolidated where the big names have a much greater sway over the market. As per a report by Transparency Market Research, the competition in the global micro guide catheters market will likely remain robust in the next couple of years on account of the dominant players present across geographies and trying to outsmart one another with various marketing strategies. Barriers to entry of new players, on the other hand, is high in the market due to expensiveness and proprietary nature of technology that key players already hold. The global market for micro guide catheters is predicted to rise at a CAGR of 7.5% from 2016 to 2024 to attain a value of US$242.0 mn by 2024-end from US$136.3 mn in 2016. The two distinct varieties of products in the global market for micro guide catheters are over-the-wire and flow-directed. Among the two, the over-the-wire micro guide catheters segment leads the market vis-à-vis volume and revenue. Going forward too, the product type will retain its dominant position on account of the swift adoption of advanced technology and greater product stability. The growth in the flow-directed segment will be driven by the flexibility it accords and the reduced risk of hemorrhage from it. Geographically, the key segments of the global market for micro guide catheters are North America, Europe, Asia Pacific, Latin America, and the Middle East and Africa. North America, among them, holds a dominant position in the market. In 2015, its share in the overall market was to the tune of 38.8%. The market in the region has been primarily bolstered by a huge pool of geriatric population and the rapid pace of technological developments. Going forward, a substantial rise in cardiovascular disease which claims a large number of lives every year, is predicted to further up demand for micro guide catheters in North America. Europe follows in the second position in terms of market share due to a large number of elderly who are highly susceptible to an array of chronic conditions. Germany in Europe, for instance, has more number of people succumbing to heart disease than the U.S. In terms of growth rate, on the other hand, the Asia Pacific micro guide catheters market is anticipated to outpace all other regions on the back of a burgeoning population, improving healthcare insurance, and rising knowledge among people about the various treatment options. Majorly boosting the global market for micro guide catheters is the rising instances of aneurysms or vascular diseases. Another factor boosting the market is the increasing uptake of minimally invasive tools. “The increasing geriatric demographic is a prime cause of the growing demand for pain-free and minimally invasive surgical options. The proliferation of these technologies into the global micro guide catheters market has allowed players to significantly boost their demand volumes over the recent years. 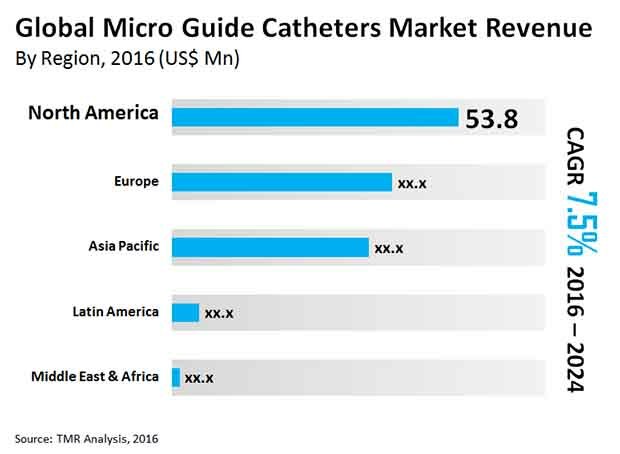 The global micro guide catheters market is also being driven by the increasing expenditure on the healthcare industry, especially in developing economies. This is encouraging globally prominent players to enter these regions and ramp up the provision of quality products,” explains the lead analyst of the TMR report.